First Listen: James Farm, 'JAMES FARM' The meeting of saxophonist Joshua Redman, pianist Aaron Parks, bassist Matt Penman and drummer Eric Harland has proved fruitful. Hear their self-titled debut, the ear-tickling first crop from a jazz quartet featuring four of the best in the business. James Farm, L-R: Matt Penman, Joshua Redman, Aaron Parks, Eric Harland. 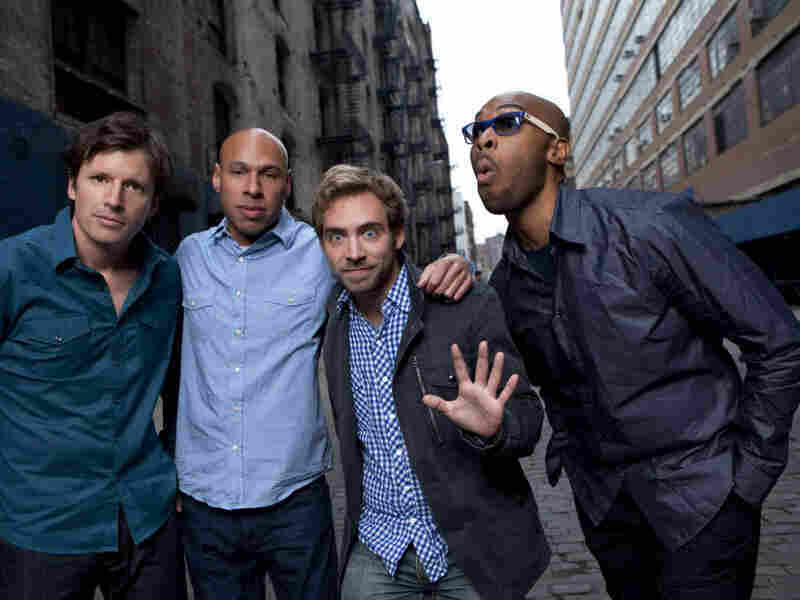 James Farm is the newish band featuring saxophonist Joshua Redman, pianist Aaron Parks, bassist Matt Penman and drummer Eric Harland. If you take the first letters of their first names, that makes JAME; it's unclear where the S FARM comes in, though it might make a good metaphor for the whole of this band making more sense than the sum of its parts. Okay, so first, meet the parts. Joshua Redman is the smooth-toned, slightly greasy tenorman (positive, not pejorative) who's recorded jazz on major labels for nearly two decades; he's a bit more understated than usual here. Aaron Parks is the youngest member by about 10 years, but his voice ripened early; his dense chords, fluid right-hand contours and sense of harmonic movement permeate this album. Matt Penman turns up on many great records; his three tunes highlight his underheard compositional abilities. And Eric Harland is among the most commanding drummers to be found anywhere; you can't find him not swinging, even if he's layering all manner of other noise over a rock beat. Redman is the best-known member here, but don't ascribe ownership to him. James Farm is expressly a collective enterprise in which each member contributes tunes. It looks a little bit odd at first blush — almost a bit random, like, why this grouping, now? — and then you remember that this is the same rhythm section as on Parks' latest album, Invisible Cinema, and that the sax-bass-drum team worked together in the SFJAZZ Collective for years. Basically, the four have put in serious time together, even before touring under their agrarian moniker. And then you listen to their self-titled debut — out April 26 — and realize that these guys do, in fact, share plenty of musical sensibilities. There's liberal borrowing from other musical silos of today, though the ominous piano riffs, backbeats and driving bass lines are transmuted as to feel untraceable to any one beatmaker or rock band, at least not directly. There's a dedication to having memorable compositions here, too, with lots of ear-candy bits: the action-movie sequence of "Chronos," the distorted kineticism of "I-10," the sloppy slow drag of "Star Crossed," and so on. They're embedded in tunes which generally stretch out over six, seven or eight-plus minutes, but in a way that encourages abandoning yourself to the morphing groove. It's a bit like four of the best in the business just called a "session" one day, but instead of standards, they each brought in their own music. And then they workshopped the arrangements and ironed out the kinks on the road, and only then put it on tape. So, instead of unsure and undercooked, it sounds taut and confident. It's one thing to play original music with others; it's another to have absorbed it over time, as a cohesive unit. And this band's labor has clearly proven fruitful.